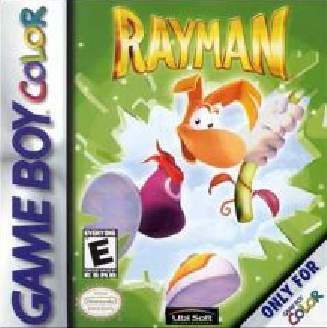 In this world only the basics actions of Rayman are available. No CAGE nor BONUS MAP is present in this map. There is the Ubi Key bonus, placed in the low-right corner of the map. The EXIT is placed in the up-right corner of the map. It is reached jumping from the Swinging Plum. Two CAGES and one BONUS MAP present. Go right: when you hear a sound it means that two Vertical Lilies platform has been activated in the far left side of the map. You can go back and jump on them, but you couldn't reach the CAGE beyond the vine: it's too far and you'll have to go back in this map and reach it with the Helico power (this will be possible once the WORLDMAP is unlocked). Continue going right until you find a Bouncing Plum. Punch it to push it in the direction you want and then jump over it to employ it as a moving device. 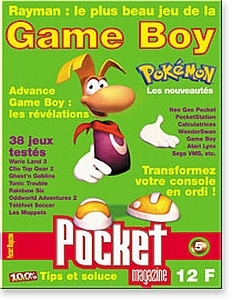 Trick: you can punch a Plum while standing on it by throwing the fist and crouch Rayman while this comes back to him. Punch the plum and make if fall from the left side, then use it as a floating device to reach a BONUS MAP. Continue going right: punch the hanged PLUM hanged on a vine to make it fall in the water and float on it to the right. On the path you will find a CAGE: punch to break it. Continue going right until you encounter a steady Swinging Plum: punch to put it in motion and jump over it and away to reach the EXIT. 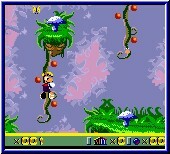 Trick: otherwise you could jump from the Swinging Plum and hang to a vine, climb up and reach the upper layer of the map. Here, going left, two Lives can be found and collected. One CAGE and BONUS MAP present. Go right, punch the PLUM to make it fall in the water. Float over it to the right. Jump on the ground: you will hear a sound for a Steady Lily platform has appeared on your left; use it to reach the higher ground, punch the Swinging Plum on the left to activate it, jump on it and from it to reach the ground above. Go right and synchronise to jump on the Falling Lily and then on the Swinging Plum. Hang to the vine and jump from on to another towards right: you will find the BONUS MAP. Trick: it's also possible to reach a spot in the up-left corner of the map where two Lives are placed, but you will need the Helico power. Go down and step over the Vertical Lily, which will carry you down to water level. During the descent punch the Plum to make it fall in the water, then float over it to the right. Go always right until you encounter a vine: climb on it to reach the upper ground. Go right and cross the small lake. When you hear a sound, go back, for a platform has appeared which allows you to reach another place with a small lake, which mirrors the one on the right. Cross the lake, hear the sound and go back: another platform will have appeared beyond the right lake; jump over it to pass the tree and reach the CAGE. Go back and climb down the vine, then go right (there is another Plum). While you are on the Plum avoid the Swinging Prickly Balls trying to follow their movement and staying as close as possible to them, then jump as they swing back towards you, landing again on the Plum. Take the Vertical Lily in the right-low corner of the map to reach the upper ground. 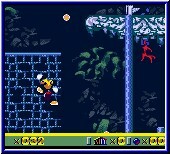 Go left until you hear a sound, then go back and use the newly appeared Lily to reach the high-right corner of the map, where, behind the Big Livingstone, is placed the EXIT. This world features for the first time the Slide action. Two CAGES present. Slide following the escaping Signpost. 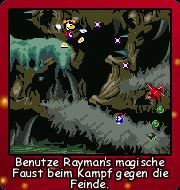 There is a CAGE below Rayman starting point in the map, but this couldn't be reached without the Hook power. There is another CAGE in the middle of the map. Continue following the Signpost to reach the EXIT in the low-left corner of the map. Two CAGES present. Follow the path. There is a CAGE in the low-right corner of the map but it's reachable only with the Helico power. Go up between the Blowing Trumpets and use them to be blown and jump from a sliding surface to another, going up following a zig-zag shaped route. 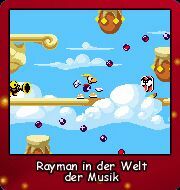 Use the last slide as a trampoline, while being blown to the left, to reach an higher slide, where another blowing trumpet stands: it will push you towards right; jump and reach the high-right corner of the map, where a CAGE is placed; break it and let Rayman fall to the right, to go back to the upper left-Blowing Trumpets. This time follow the normal path and reach the left side of the map. Here you'll find a Vertical Trumpet: jump over it repeatedly with the proper timing to give it impulse to raise up. Punch while standing on it to move in the opposite direction of the fist. Use the Vertical Trumpet to reach the up-left corner of the map. Follow the path (beware the Jumper Note, for it can't be hurt) from here to reach the EXIT, placed in the upper-mid part of the map. Trick: jump the Signpost the first time to continue sliding right and take a Life, then go back and to it and finish the map. Two CAGES and one BONUS MAP present. Go right to activate the Vertical Cloud, and go back to take the Gold Fist in the up-right corner of the map. Follow the path to the right until the two synchronised Horizontal Clouds and let Rayman fall in the hole between the notes below them. Go left until you find the BONUS MAP. Jump again to the initial slide and go right, this time jumping from one Cloud to the other. Go to the far right and come back from below. Follow the Tings and step on the Cloud, which will move to the left (crouch while over it to pass below a big solid block). Go up to the slide, jump the Toon Walker and catch the Ting above on the right: you will hear a sound and a Cloud will appear on the left. Jump over it and let it carry you to the left, jump down, follow the path, then reach and take the Heart bonus above: this will make appear a Blowing Trumpet: let it blow you towards the left, step on the Cloud and let it carry you up. Go left and find the CAGE, but it will only be reachable with the Hook power. Slide back to the Blowing Trumpet and pass it, continuing to the right. Follow the Tings in the little sliding maze (beware the notes). Don't go to the EXIT now: step on the Cloud and let it carry you to the right. Continue going right and, when you reach the far right side of the map, up, using the Vertical Clouds, to reach and break the CAGE. Then go back to the EXIT using the Cloud (stay crouched) in the low-right corner of the map. Two CAGES and a BONUS MAP present. Jump on the Disappearing Cloud and then up across the slide. Let the Blowing Trumpets blow you toward left, going up the sliding surface. Reach the Vertical Trumpet and use it to go up. Crouch on the slide as the Blowing Trumpet push you toward right, to avoid the note at mid-air. Follow the slides going down. Beware: the Jumper Note cannot be killed but only avoided. Don't to follow the line of three Tings with the jump, but just avoid the notes and go down. When you are in the low-right corner, go left: you will encounter a CAGE hanged. After breaking it, continue going left and you'll be back at the beginning of the map. This time a new Cloud will be there: go over it to skip a big part of the route and return to the slide where the three Tings stood: this time follow them with a jump and land near a Vertical Trumpet, which will carry you up. Let the left Blowing Trumpet blow you and jump to reach the upper slide, then go to the left. After the three Prickly Balls and the notes above your head (crouch to avoid them) you have to land on a Cloud: from here you can reach a CAGE, but only with the Helico power. Go to the Vertical Trumpet on the left and use it to go up. Slide down (couch, for the Blowing Trumpets will pull you towards a group of notes), but don't jump on the three Clouds to reach the EXIT: instead fall from the right side, on the Falling Bongo, then go left to reach the BONUS MAP. After jump up to return to the slide with the pulling Blowing Trumpets and aim for the EXIT this time. 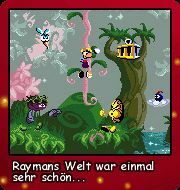 From this world Rayman acquires the Helicopter power. Two CAGES and one BONUS MAP present. Go right following the Tings. Jump down on the water-leaf to reach the BONUS MAP, at water level in the middle of the map. 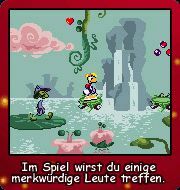 Go back and climb over the first big water-flower, you will notice a ring suspended in the air on the left: if you already have the Hook power you can use it to reach the up-left corner of the map, where a CAGE is placed. Go back towards right, crossing the whole map. When you are on an Horizontal Lily platform, near the low-right corner of the map, you will hear a sound: stand on the Lily and let it take you back, for another Lily has appeared that will carry you up. Hang to the vines and jump from one to another towards left, until you find the other CAGE. Go back to the right. The EXIT is in the up-right corner of the map. Two CAGES present. Go right and then up the floating flowers, step on the Lily, on the left, which will carry you above. Jump right using the Helico and follow the Tings. You will find yourself between two Swinging Prickly Fruits, on a floating flower with a Plum hanged below; hang to the edge of the flower and punch the Plum to make it fall in the water: use it to float right, to the CAGE. Hang and step on the rock above you, go right, jump on the Falling Lilies and hang to the lower vine. There are some Rings to the right which could lead you to the second CAGE if you have the Hook power. Otherwise go up and right, for the EXIT is in the right-up corner of the map. One CAGE present. This is a Water-up map. The CAGE appears below the last leaf when you step near the EXIT Signpost. This world combines the slides with the Helico power. Level 1 One CAGE and one BONUS MAP present. Go right and catch the Ting above the first Springing Cloud, then go back for a Cloud has appeared, allowing to reach the BONUS MAP above. Go right, use the Springing Cloud to jump up and go left. Beware the slippery surfaces. Put the Turning Prickly Ball in motion with a punch. Pass it, go up and then right. Go up with the Springing Clouds and then left. Punch the Turning Prickly Ball when you are moving on the Horizontal Cloud. Hang to the sliding surfaces and go up. Step on the Horizontal Cloud moving toward right, crouch to avoid the first Prickly Ball, jump over the second and crouch again below the third. Slide, hang to the stalagmite and jump with the right timing on the Disappearing Cloud. Jump on the Springing Clouds which appear one after the other. Go left. After the slide there is a Springing Cloud and a Ring which allows to reach the CAGE, but only with the Hook power. Follow the slides down, go left avoiding the Fire and reach the EXIT behind the rock column. Level 2 One CAGE present. Step on the first Cloud, which will carry you up. Go left jumping on the slides. Hang to the stalactite and jump from one to another and collect the Ting at the top of the last one: this will cause the CAGE above to appear. Go back and up, then right, up and left; pass the Disappearing Cloud and take the Heart to the left, for another Cloud will appear: it will move horizontally when you step on, so when it comes back you can use it to go up, then walk left. 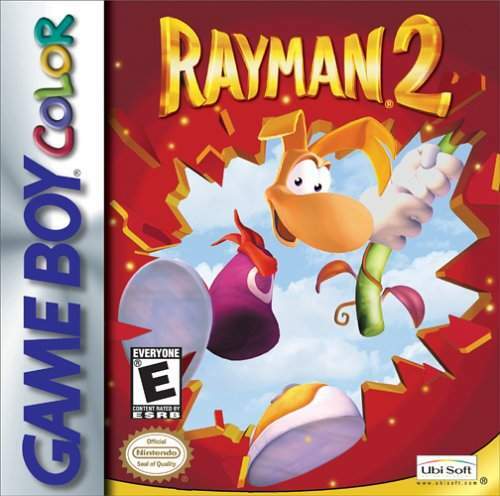 Letting Rayman fall to the left you could reach you will reach the previously appeared CAGE. Go back. 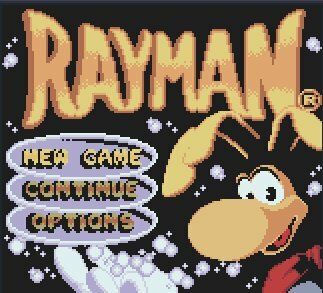 Use the Disappearing Cloud to reach the upper side, avoid the Throwing-Head Man and go right, then let Rayman fall, and fall again following the Tings (use the Helico). You have returned at the beginning of the map. Step on the Cloud, it will move carrying you down and left. Put in motion the Turning Prickly Ball with a punch and pass it. Slide right and go up climbing the stalagmites. Follow the path: this will lead you at the starting point of the map. Step on the last Cloud and go right. Follow the path: this will lead you at the starting point of the map. Go right, for some Clouds have now appeared over the spikes and you can reach the right side jumping on them. Go up and follow the slides. In the upper part of the map is placed the EXIT. Level 3 Two CAGES and a BONUS MAP present. This is a Super-Helico map. Go right, follow the path and reach the low part of the map. Take the Tings in the spiked tunnels above the three Prickly Balls: this will make the Prickly Balls blocking the entrance to the 4th tunnel disappear: here a CAGE is placed. Go down and follow the path, putting the Turning Prickly Balls in motion with the punch in order to pass them. When you find a fork (up or left), go up for the BONUS MAP. Coming back, go down-left and (crouch) on the Horizontal Cloud to pass in the spiked tunnel and reach the other CAGE. Go back and up-left (beware the Prickly Ball that will start following you): Follow the Tings to the EXIT. Level 4 Two CAGES present. Go up, reaching the upper slide. Catch the Vertical Cloud and go up. Go right, slide (crouched) and hang to the stalagmite. Go right and jump with the Helico after the slide: you will hang to a rock above the spikes. Follow the path up along the slides. Hang to the stalactite and go left jump on the Cloud near the Throwing-Head Map, in the right corner of the screen. Take it: it will carry you left. Punch the Turning and jump the Steady Prickly Balls while standing on the Cloud. Going left you will pass above a CAGE, which can be reached only employing the Hook power. 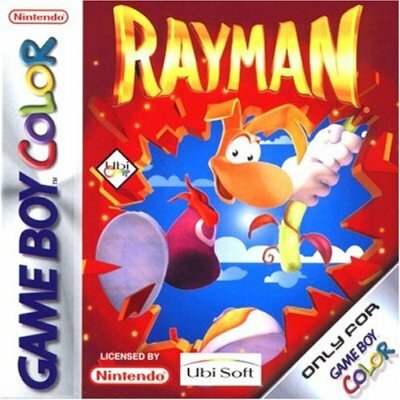 Go left , slide down and let Rayman fall. Go right and step on the Cloud, stay crouched on it while it carries you right to another Cloud, and then to the second CAGE. Take the other Cloud to exit from above. Slide left and follow the Tings to fall on the Cloud which will carry you left, to the EXIT. 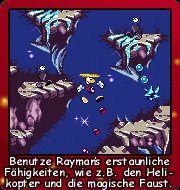 From this world Rayman acquires the Hook power. One CAGE and one BONUS MAP present. Grab the Ring with the Hook and jump on the column. Go back with the Ring and use the newly appeared Lily to reach the Life. Go right and jump on the Falling Lily and from here across the ground above, near the sleeping Blowing Fluffy. 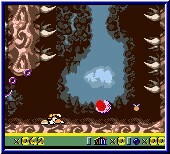 Punch to awake it and step on: the blow combined with Rayman's jump will make you reach the top of the column. Punch the hanging Plum and let it fall on the head of the Big Livingstone, then jump on it to reach the top of the other column to the right. Use the Hook power on the Ring to proceed up-right. 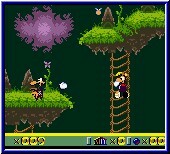 The two Swinging Plum are synchronised: just jump from the first when it reaches the far right point of its movement. Continue right until the Bouncing Plum. Punch and jump on it. Punch and crouch while standing above it if you need to direct it. Employ the awake Blowing Fluffies and to pass from on blow to the other to avoid the thorns. There is a Falling Ring in the up-right corner of the map: grab and don't leave it while it fall until you reach the bottom of the map (where there is a Gold Fist and the BONUS MAP). Grab the Ring and swing up, on the ground above. Punch the Fluffy and let it blow you up, in order to reach the upper Ring and take the Ting on the left: this will make the CAGE appear. Fall and swing from one Ring to another towards left. Punch the Fluffy, use the blown to reach the Plum above and put it in motion with a punch. Punch the hanging Plum and use it to reach the ground near the Swinging Plum, jump on this and then up. Grab the Rings to move right. Hang near the CAGE and punch to break it. Then swing back along the Ring chain to reach the EXIT. One CAGE and one BONUS MAP present. Go right, grab the Ring, fall down with the falling Lily and jump away before it hits the thorns below, grabbing the other Ring. Punch the sleeping Blowing Fluffy and use its blow to reach the Ring above. Go up and then right. Jump from the three Rings (beware: the 3rd if a Falling one) and reach the active Fluffies: use these to avoid the spikes and follow the Tings down. Follow the "S" shaped path down. Step on the Horizontal Lily moving towards left and stay crouched to avoid the spikes. Reach the sleeping Blowing Fluffy and use it to jump over the spikes on the left. Beware: punch the hanging Plum while you fall, or you won't get another chance to do it. Use the Plum (now bouncing) to reach the upper ground (the one from which some spikes hang). Grab from here the Ring on the left and reach the CAGE. Let the Vertical Plum below carry you down and jump left from it when you reach the bottom (use the Helico carefully to avoid the hanging spikes). Punch the hanging Plum and use it to reach the EXIT. Otherwise you can jump the Signpost and go to the BONUS MAP beyond. Two CAGES present. Go right (beware the Falling Lily). When you are below and Horizontal Lily, moving right and left, look down for a Ting: this will lead you to and Horizontal Lily, carrying you left (jump to avoid spikes and Swinging Prickly Balls) to a CAGE. Jump up and return to the previous spot. Go up and then right, then follow the "S" shaped path down. Step on the Horizontal Lily moving towards right, jump and crouch to avoid the spikes, and reach the sleeping Blowing Fluffy. Use it to go above. Then go left. Follow the Tings to reach a Life. Use the Swinging Plum and punch the next Plum (hanging). Use it to reach the top of the column below. Jump on the Lily below the Swinging Prickly Ball (crouch to avoid it) and go left. Follow the Tings to reach the EXIT. Jump the Signpost and use the sleeping Blowing Fluffy to go up (direction the jump right to avoid the spikes above). Use the Ring to reach the CAGE. Go up. Punch the Turning Prickly ball to activate it and pass. Wait for the Falling Bat-Ring and grab it to go up. Go left and follow the path up. At the top you could go left (by a Ring) to take a Life, or right to continue: in this case follow the path down. Grab the first two Rings and look for the 3rd one below, in order to reach the CAGE. Go back and right. Look for the Ting blow the second Falling Rock, for it indicates a lower path (move left while falling to land safely on the ground rather then in the lava). Pass crouched the spiked tunnel with Flames, use the two Falling Rings (grab jumping near them, or the swing will carry you in the lava), and then go up to reach the CAGE. Return above to the previous spot, go on to the right and grab the Falling Bat-Ring to go up. Climb the stalactite and punch the Turning Prickly Ball to activate and then pass it. Go up. Grab the Ring an follow the Tings and reach the EXIT placed in the up-right corner of the map. Two CAGES and one BONUS MAP present. Go up on the "zig-zag" path and then right. Take the Ting below the Vertical Prickly Ball moving up and down to activate the Falling Bat-Ring to the right. Let it carry you up and go left to take the CAGE. Go right and follow the Tings down. Look for the BONUS MAP at the bottom on the left. Go right and then up. Punch to activate the Turning Prickly Balls. Use the Falling Bat-Rings to go on. You'll find two platforms, one above the other. Step on the upper to make it move up, the fall on the one below and let it carry you down. Go down and then left. Take the lower Ting: this will activate a platform allowing you to reach the stalactite and then the CAGE. Go back, then up, then left: there lies the EXIT. One CAGE present. This is a Lava-up map. Th CAGE is on the left side, at middle height in the map (two Tings indicates where to jump to reach it). The Lava will stop when you reach the CAGE. One CAGE and one BONUS MAP present. This is a Super-Helico map. Go up, activate the Turning Prickly Ball, pass it and go down, turn and go up: 4 Prickly Balls will start following you (push A repeatedly to escape them). In the horizontal tunnel above 4 Prickly Balls will start following you. Go right until you hear a sound then come back, avoiding the Prickly Balls, for a CAGE will have appeared. Follow the path down. Go up the vertical tunnel with the 4 Horizontal Prickly Balls in motion to reach the BONUS MAP. Go down and follow the path left, until the EXIT. Two CAGES and one BONUS MAP present. Go right, jump on the Swinging Plum and wait to hear a sound, then fall where the Ting has appeared. An Horizontal Lily will carry you to the CAGE. Come back and go right. Do a long jump (with Helico) after the first and second slides. Go up and then left: slide staying crouched to avoid the spikes. Go left till the far left side of the map, climb the vine and go back when you hear a sound: a Vertical Lily would have appeared, which will carry you to the second CAGE. Climb the vines, jump the Signpost and step on the Horizontal Lily below to reach the BONUS MAP. Go back to the EXIT. No CAGE nor BONUS MAP is present in this map. 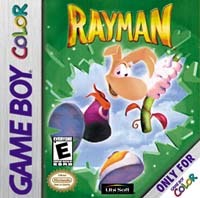 This is the Dark Rayman map: escape from this twin copy of yourself, for touching it will result in death. Go right, follow the Ting and fall down in the 3rd hole: the Ting below will activate two Clouds to go above. Go up, then left. Hang on the vine, catch the Ting to activate the Cloud above, then go up and right. Follow the Tings, reaching the far right side of the map, then go down and left. Crawl below the narrow passage and fall down on the Ting. Go right following the Tings and take the one near the rock wall to activate the Cloud below the EXIT. 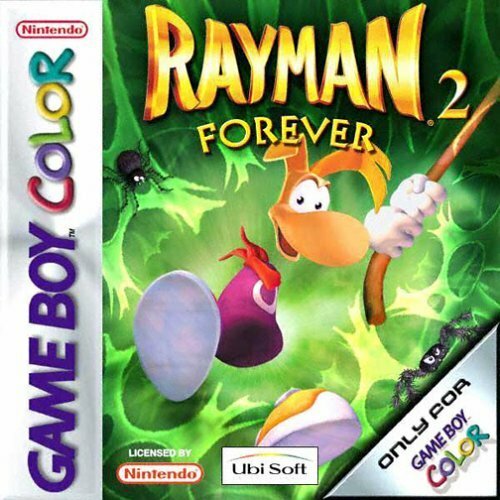 Jump the incoming Dark Rayman and go back. Use the Cloud to reach the EXIT. One CAGE and one BONUS MAP present. This is the Inverted Commands map. Go right, then up by the Vertical Lily, then left. Pss the two slides, hang on the vine and go up. Use the Ring chain to go right (the second one will carry you: stay grabbed till it's near the 3rd. The last two are Falling) and reach the CAGE. Go down, then right, following the Tings. Punch the sleeping Blowing Fluffy and go up. Catch the Heart on the left, behind the two Carnivorous Plants: this will activate the Lilies on the other side of the rock wall, which will carry you to the BONUS MAP. Go back and slide down (bewaring the spikes on the sides). Follow the Tings and the appearing Lilies, and reach the EXIT in the up-right corner of the map, after the Ring. Big Boss: Mr. Dark Avoid his attacks and don't get hit by him while in globe form. Punch it 3 times while in globe form: his size will reduce and he will revert to human form, passing to the next attack form (leaving an Heart in the up-right corner). If it's not hit 3 times fast enough, it will revert to human form and repeat the previous attack form. The attack forms sequence is: · Fire Storm · Fireballs · Lightning Bolts After defeating Mr. Dark, write the password gained. 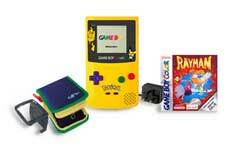 Turn off the GBC after the Credits. Turn it on and insert the password: this will give you access to the Worldmap. 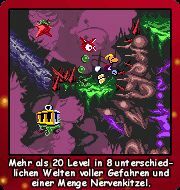 Dark Legacy - These world can be accesses only when the game is 100% complete: all previous levels cleared and all CAGES taken. These new levels will unlock one after the other. There is no CAGE nor BONUS MAP present. Slide, jump with the Helico and grab the Ring. Go up (beware the Horizontal Prickly Ball coming towards you from the right, on the first ledge). Go right, hang to the vine, jump and crouch to avoid the Swinging Prickly Ball). Go down following the Tings (beware the spikes below). Go left in the sliding passage, crouching to avoid the spikes. Climb the vines (punch the Turning Prickly Ball to pass it). Slide down and jump left when you reach the lower ledge, to avoid the Falling Prickly Fruit. Go up-left, jump on place to avoid the Prickly Ball which comes from behind (and will then come back). Follow the path, until you reach a Lily with a Ting on the right: take the Ting to make it disappear and fall down, hanging to the vine before reaching the spikes at the bottom. Jump on the Lily and let it carry you, jumping to avoid the spikes on the way. Jump on the Lilies one above the other in the vertical tunnel, bewaring the Falling Prickly Fruits. Go right along the horizontal slide and catch the Ting (beware the inertia). Go down and grab the newly appeared Ring. Go down and catch the Ting below. Go back on the horizontal slide, for the 3 Prickly Balls blocking the right side will have disappeared. Go down. Grab the Ring below the 45° slide, before falling on the spikes. Go left and then climb the vines (avoid the Prickly Ball incoming below you jumping from one vine to the other) to reach the Ting above: this will remove the Prickly Ball from the passage below. Go down and then slide and jump left (bewaring the sliding surfaces). Take the last Ting, for it will the make the EXIT Signpost appear. You start this map falling on a slide: crouch to avoid the spikes, jump from it and reach the small slide beyond the spikes. Grab the Ring, step on the Falling Lily, go up and jump right, avoiding the Swinging Prickly Fruit. Trick: beware the sliding surfaces, for your jumps will be longer after moving on them. Step on the Lily on the right: this will carry you on. Jump and crouch to avoid the spikes along the route, pass to the other one and punch to move the Turning Prickly Balls. Reach the horizontal slide, avoid the Prickly Balls and grab the Falling Ring. Fall with it and jump away left inside the tunnel below. Avoid the flames and step on the Falling Lily. Jump away right and hang to the vine. Go right, bewaring the Prickly Balls behind you, reach the slide and crouch to avoid the spikes. Jump on the ledge with the Heart. Grab the Falling Bat-Ring and let it pull you up. Jump right on the ledge with the two Flames and grab the first Ring. Let the Falling Rings carry you down and jump from one to another inside the lateral tunnels before reaching the spikes; the sequence is: left, right, left. Punch the Turning Prickly Ball before landing on the Lily. Go left and step on the column before the Swinging Prickly Fruit. Hang on the left side and jump the Fruit, then grab the next Ring. Punch while you are in the air to remove the Turning Prickly Ball from the Ring hidden behind it: grab it and then climb quickly on the vine. Continue going left until you reach the EXIT, above the Blowing Fluffy and the Horizontal Prickly Ball. This is a Super-Helico map. Follow the path. Catch the 3 Tings near the Flames to make the Prickly Ball on the right disappear. Continue going right. Punch the Turning Prickly Ball and catch the 3 Tings: this will open the left passage below; go back and reach this passage; catch the Ting at the and of the tunnel (bewaring the Prickly Balls following you): this will open the passage on the right. Go right, down and then left: follow the tunnel until the last Ting, catch it to make the 3 Prickly Balls blocking the right passage move. Go right until the tunnel the 3 Bats. Go left and then down, catch the last Ting to free the passage above. Go up, then right, then follow the path: this will lead you down. Punch the Turning Prickly Ball, pass it and reach the EXIT. Time Attack - This map collects all the BONUS MAPS previously encountered in the game. It's accessible once the 4 levels of Dark Legacy have been cleared. A, Right, B, Up, A, Left, B, Down, A, Right, B, Up, A, Left, and B.